If you want to make your own microbe biosphere, read Part 1 for the ‘ingredients.’ This is a long-term project (8 weeks) so feel free to join us any time, share your photos on our flickr group, and your stories in the comments of these posts. You’ll recall that microbes are creatures too small to see without a microscope. Our biospheres (known as Winogradsky columns) will help the microbes grow in colorful communities, separate and large enough for us to see with just our eyes. Our biospheres will be “self-sustaining”—after we put our ingredients together, we don’t need to add anything except indirect sunlight. All on their own, the microbes will continue to grow (for years, if we let them!). A note before we start. We're making mud. Cool, right? But wear old clothes, lay down drop cloths, etc. for easy cleanup. Also, the amount of water and dirt suggested is just a guesstimate. 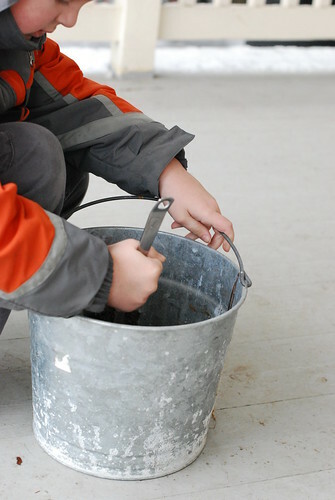 Soil (and mud) contain varying amounts of water, and it may take you a lot more or a lot less dirt or water to fill your jar as high as you’ll need to. Our family is making this project with you (we’re a few days ahead) so I’m sharing what we learn as we go along. Another note about dirt: use any dirt you can find. You can even use sand and brackish (salty fresh) water. 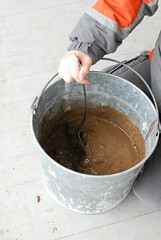 You can use potting soil and tap water (although it’s been sterilized, so it may take much longer for microbes to grow). Last, jar size: some people worry they need a large jar. You can use a fairly small jar instead (2 or 3 cups in size). Just add the ingredients proportionately. Post in the comments if you need help. 1. 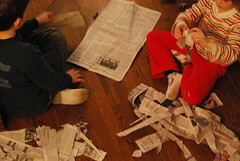 Shred your newspaper into small pieces. Set aside. 2. Take your bucket and dump all your dirt in. Now add a little of your water. Start to mix them together: you’re aiming for the consistency of a muddy milkshake. Add water slowly so it doesn’t get too thin. Stop adding water when it's the right thickness. Save any remaining water. 3. Add your newspaper (or other paper); stir. Newspaper is a source of carbon for our microbes. 4. 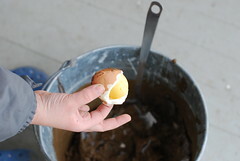 Now, mix in your ground blackboard chalk OR ground egg shells. The chalk provides calcium for the microbes. Some Winogradsky column “recipes” only call for chalk. We put only chalk, newspaper, dirt, and water in one of our jars to see if it would be enough. 5. Next, stir in your egg yolk. I suggested using hard-boiled egg yolk but uncooked egg yolk is ok too. Or, you can grate some cheese. If you’re vegan, you can use plaster of paris instead. 6. 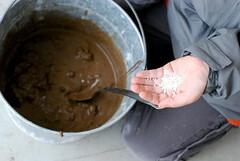 Then, using a funnel (if you need to), pour your muddy mix into your jar. You’ll need enough mud to fill the jar 90% of the way (I know, I said enough dirt to fill it 2/3 full, but once you’ve made mud, you might find you have way too little, or too much, to fill your jar 90%). 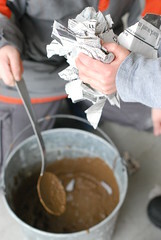 If you find, as we did, that your mixture doesn’t fill your jar 90%, add more dirt and water from your original sources to the bucket and mix to a milkshake consistency; stir into the mud in the jar. 7. Now, put a lid on your jar and let the mud settle. Tap the jar gently if you need to: you’re getting rid of any air bubbles, and allowing any extra water to rise to the surface. After 15 or 20 minutes, check to see how much water you have at the top: you need about 1 inch or so of water on top of your mud. Add more water (use tap water if you’ve used all your source water up). 8. 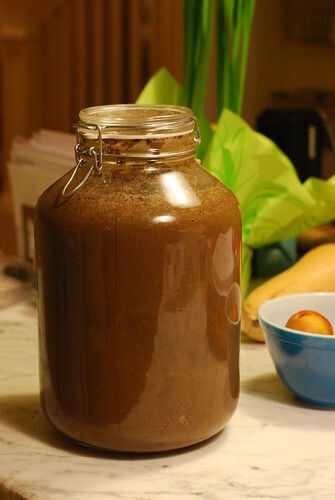 Set your jar in a sunny, well-lit room, but outside of direct sunlight. Choose your spot well, because you should not move your jar for several weeks. Also, make sure your jar doesn’t get too warm; it needs to stay at room temperature. Use the same dirt and water source, but use 2 or 3 jars that are very different in size. Use the same dirt and water source and 3 jars. Place one jar in total darkness, another jar in the well-lit room, and another jar in a spot that receives direct sunlight for long periods of the day. Use 2 or 3 jars, and dirt and water from different sources. We are making biospheres using mud and water from a stream; dirt and snowmelt from our yard; and potting soil and tap water. Label the jars with the dirt source. Check back in next Thursday to see what we can see—we will talk more about the ‘nutrients’ we put in our jars and what we can expect to see in coming weeks.